Texas 14 November 2000, One Jar of Dill Pickles, c. 2001. From Julie Green, The Last Supper: 700 Plates Illustrating Final Meals of U.S. Death Row Inmates, 2000 – ongoing. Opening Reception August 30, 5 - 6 p.m. In 1999, Julie Green was struck by an account in the newspaper of a death row inmate’s last meal. 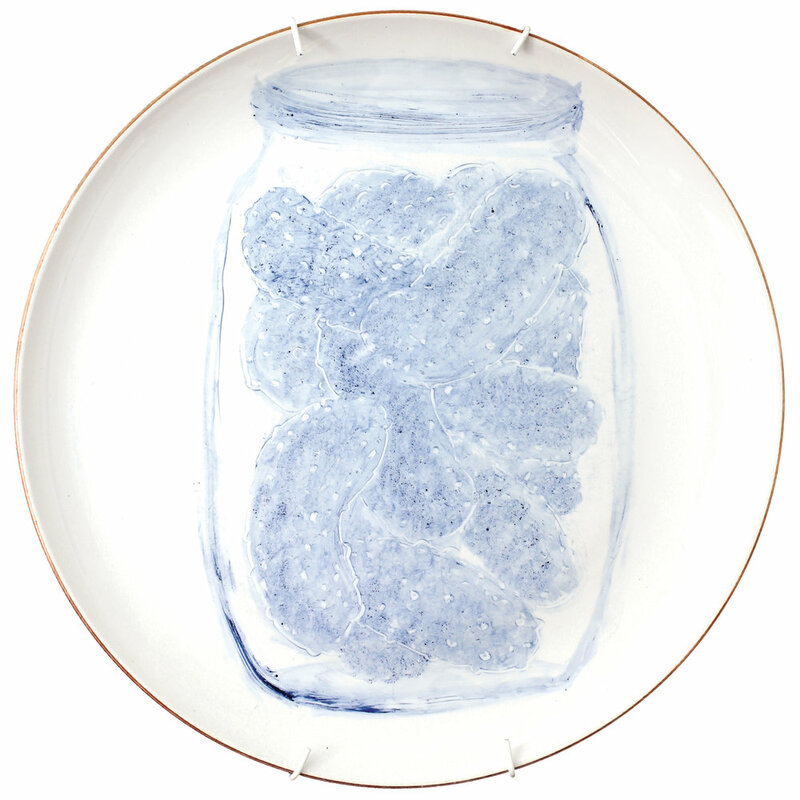 Since then, Green has painted the final meals of over 700 death row inmates onto individual kiln-fired ceramic plates. She plans to add fifty plates a year until capital punishment is abolished in the United States. The meal requests, which reflect region, race, and economic background, humanize the men and women on death row. Employees at the Indiana Department of Corrections once recalled a person’s request: “He told us he never had a birthday cake so we ordered a birthday cake for him.” In states with meal options, selections are modest—limited to what is already available in the prison kitchen. None of the states allow alcohol. Cigarettes, though technically banned, are sometimes granted. The Last Supper has particular meaning for Texas, which carries out the largest number of executions in the United States. It is the only death penalty state that does not allow a meal selection, serving only the standard prison meal of the day. Julie Green is a professor of art at Oregon State University and is represented by Upfor Gallery in Portland, Oregon. The Last Supper project has been featured on PBS, in The New York Times and on National Public Radio. In the ten years that have passed since the exhibition was last shown in Texas (DiverseWorks, 2007), the number of plates has increased threefold. In conjunction with Julie Green's The Last Supper: 700 Plates Illustrating Final Meals of U.S. Death Row Inmates, the Texas State Galleries are hosting a series of conversations relevant to the 2017–2018 Common Experience theme, The Search for Justice: Our Response to Crime in the 21st Century. Aja Segapeli, San Elizario El Paso, 2016. John Muehl, Aggressive Observation, 2016, Brass, glass, forged steel, resin, moth specimen. 2016 School of Art and Design BFA Thesis Exhibition. Students earning a Bachelor of Fine Arts degree from the School of Art and Design at Texas State University are required to exhibit art work created in their thesis semester. The BFA Thesis Exhibitions, entirely conceived and executed by the thesis students, highlight the depth and range of School of Art and Design students and their creative practice. Now on view: Ann Hamilton, Fly Together. The installation of Pledges of Allegiance at Texas State Galleries is generously supported by contributions from the Center for Diversity and Gender Studies at Texas State University. To share this project on social media, please use #PledgesofAllegiance.